The roasted carrot and crunchy seed topping marries perfectly with the smoky flavours of toasted cumin in this soup. Place the olive oil, onions, garlic, ginger, sweet potato and carrots in a large saucepan and over medium heat. Cook, stirring often, until onion is soft and translucent. Add the crushed cumin and cook for another 30 seconds to one minute or until fragrant. Add the maple syrup and stock, reduce the heat to low and simmer for 30 minutes or until sweet potato and carrot is very tender. Add the feta and blend with a hand-held blender until smooth. Season generously to taste. 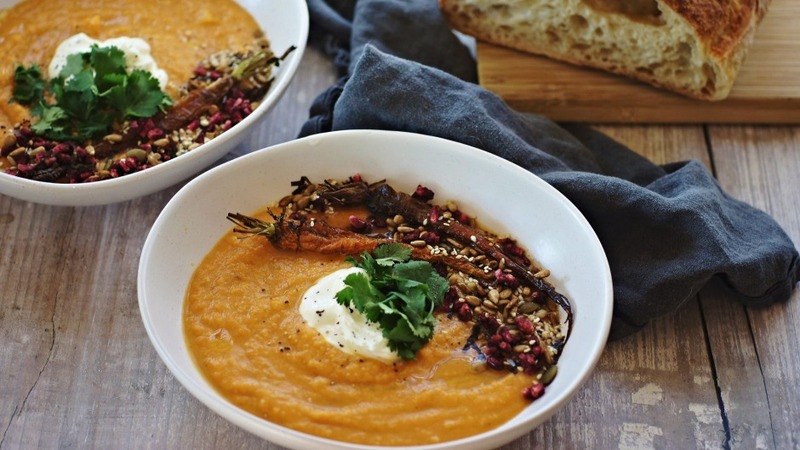 Pour soup into bowls, top with a dollop of yoghurt, coriander leaves and other toppings of your choice and serve.